A month ago, I received a delegation from Yunnan province at my workplace. The Embassy provided an interpreter, but naturally I paid attention to their spoken Mandarin. Nearly two years had gone by since I had, for all intents and purposes, stopped my experiment and had no contact with the language. How pleased I was, then, to understand many words. Yet what most struck me was how familiar the language sounded. After the meeting, I mentioned to the head of the delegation, through the interpreter, that their Mandarin sounded very standard. He confirmed that it was so. I couldn’t resist venturing a few isolated words in Chinese during the visit, and later, the interpreter told a colleague of mine that my pronunciation in Mandarin was good. I don’t know if he was just being polite or was interested in an internship I had mentioned to him, but it was motivational to get the positive feedback, nonetheless. The two hours or so with the Yunnan delegation was the fuel I needed to start really watching Mandarin again. I won’t announce dramatically that I’m back (wo hwei lai la), since I’ve done that before and then disappeared again for nearly a year. I hope and expect that this is not just another fitful start. The test will come in a couple of weeks when vacation is over and I’m back to work and back the Law classes. I have watched Mandarin now about every other day for the past 21 days, for an average of 36 minutes per day. The 1,000-hour Mandarin experiment is a long, sometimes arduous journey, and I would probably give up entirely if, after nearly two years of very little viewing, I felt that I had forgotten the little that I had learned. Fortunately, the contrary seems to be true: I have absolutely no contact with Mandarin for several months at a time, yet when I start watching Qiao Hu or one of my go-to Chinese films again, my impression is that my comprehension is about the same as before. Granted, I still understand very little, but the sounds are as familiar and I seem to pick up a similar amount of words and expressions. In other words, though I have gained little ground in the mighty battle to learn Chinese, I seem to have held that ground despite long periods of inactivity. So, what have I watched so far in this new beginning? Previously, after the 400-hour mark, I had been watching movies with English subtitles far above my planned average. Therefore, when I started the experiment again in July, I decided to watch videos without any subtitles. Of the 12 hours of viewing in July, I watched a couple of hours of Qiao Hu, and the rest was completely different content. I went into youku.com, the Chinese YouTube, and randomly clicked on an image (since I don’t understand any of the writing). It took me to a Chinese soap opera about the rich CEO of a jewelry design company, a comparatively poor, young female worker at said company, their network of colleagues and friends, and their budding romance. To my taste, it’s mediocre, like any soap opera, but less bad than most. It’s a bit silly at times, rather than offensive, the acting is passable, there are nice visuals, and my friends at chinese-forums.com have confirmed that the dialogue is in standard Mandarin. I’ve watched eleven episodes already, and I find the viewing somewhere between tolerable and amusing, depending on my mood. My girlfriend occasionally watches a bit with me and gets a kick out of it. I plan to post at least once a month now, instead of once a week as I did in 2014 and 2015. I do hope you’ll check in for updates and leave comments as well. The Natural Language Institute method for language-learning, in a word, is combining immersive practice of reading, writing, listening, and speaking, using authentic materials and native speakers as teachers or guides. Training all four language skills together in an acquisition program not only leads to more balanced and useful fluency, it also produces a synergistic effect. In other words, the combined result is greater than the sum of the parts. For example, while listening is obviously necessary to learn to speak, conversely, practicing speaking—while getting corrections or some type of feedback from native speakers (did they understand what you said? )—is essential for fully grasping the correct pronunciation of words and thus is very helpful in learning to accurately pick them out while listening to conversation. Just to provide a couple more examples, writing is very helpful in improving speaking, since it is slow-motion practice in constructing sentences and expressing ideas in a foreign language. Reading not only provides a necessary basis for writing, it is also a very useful check on pronunciation and provides the broad vocabulary and accurate grammatical structures necessary for all three other skills. Thus, my Mandarin Experiment and my French Fluency Recovery Project (FFRP) suffer from a serious flaw: they are one-sided listening programs and fail to benefit from the abovementioned synergies. In particular, as I watch Chinese shows and try to learn new words and expressions and consolidate those I already know, I miss very much having the opportunity to actually pronounce them to native Chinese speakers and get their corrections. If I had the opportunity to do so, I believe my listening comprehension would progress much more rapidly. So why am I proceeding in a way that I myself consider far from ideal? With regards to the Mandarin Experiment, the main reason is precisely the experimental nature of the project and its attempt to isolate a variable (can I learn to understand oral Mandarin just by watching and listening to authentic video?). There is, however, a second reason, which was one of the many inspirations for the Mandarin Experiment design and also happens to be the sole reason for my almost exclusive listening approach in the FFRP: listening is by far the easiest and most convenient of the four skills to practice. I spend no money in my Mandarin experiment and have no hassle in arranging classes. There is no transportation involved. I can do it regardless of my energy level or motivation. I can profitably put in just five minutes or two straight hours—whatever fits in my day. For someone like me, who has an intense schedule with multiple time-consuming professional, academic, and personal commitments, this convenience can be a decisive factor in whether to even undertake and sustain a long-term language-acquisition project. Likewise, the eight odd minutes I put into the FFRP are almost exclusively listening to French radio when I am about to go to sleep. I enjoy it tremendously and it is so easy to do. It also serves multiple purposes: not only am I practicing my French, I am getting world news from a fine media source and it is very effective in getting me to unwind and relax mentally as I prepare to sleep. In fact, there have been times that listening to French radio was the only way I could get myself to fall asleep! In sum—experimental purposes aside—my projects reveal a big tradeoff between the ease and convenience of a listening-based acquisition approach and the effectiveness and synergy of a balanced program that combines the four language skills. Surprise! Wo Hwei Lai La! Seismic changes in my personal life and a promotion at work contributed to my suspending the Mandarin experiment for several months. The last time I watched Chinese regularly was in early October of last year, meaning that, for all intents and purposes, I took a ten-month hiatus. I viewed fewer than two hours in December and five hours in January, then not a single minute of Chinese until the end of July. My hectic schedule has been exacerbated by the eleven international trips I’ve already taken this year. However, as I began my July trip to New York, I watched an inflight movie—The Martian with Matt Damon—in order to relax a bit. At one point, some Chinese officials spoke in Mandarin, and I understood several words—enough to enhance my comprehension of the scene. “I have got to start my viewing again,” I thought for the umpteenth time, but with much more conviction than before. Though for the next ten days I watched nothing, on August 9 I began again for good, with bread-and-butter daily viewing. I’ve decided to watch as much Qiao Hu as I can take. The downside is that the show’s main demographic seems to be Taiwanese toddlers, so it somewhat lacks inherent thematic appeal for me (please note the sardonic understatement). I mean, I’m already pretty good at washing my hands and using the toilet. The upside is that, like a Taiwanese 10-month-old, I’m sometimes able to understand about half of what is said, without subtitles of course. It’s authentic material—just as I like, and as my experiment demands—that is designed for low-level speakers of Mandarin (i.e., toddlers). The past three weeks have been quite intense at work, and I haven’t done too much Mandarin viewing, except for four movies early in the month. I did watch a regular English-language TV show recently–an entire season–for the first time in many years. Narcos, while a US show, has as its director and main actor Brazilians, and a good deal of the dialogue is in Spanish. I found this mix fascinating, and I gobbled up most of the ten episodes in just two (late) nights. While I enjoy Mandarin, listening to French is truly relaxing for me. In fact–and I find this hilarious–I have become somewhat addicted to falling asleep while listening to French news. My brain won’t turn off now without it. I’ve also started reading a book in French, a few minutes each day. So instead of a regular blog post on my Mandarin experiment, I wrote up, originally in French, a reflection on my French Fluency Recovery Project and how it relates to my Mandarin experiment. I’ll paste an English translation below. But so as not to leave you entirely bereft of news on my Mandarin project, here’s a wrap-up. The past three weeks, I’ve watched a little over 13 hours of Mandarin. The best part was watching four movies with a friend: Touch of the Light, Getting Home, Shower, and Hero. The first two I had only watched once, and Touch of the Light, I had watched without subtitles the first time around. These are both contemporary movies that are definitely worth a viewing. Ok, here is the text I promised. Please access the original French version here. I’m in the midst of two language-acquisition projects. It’s an interest I’ve had since I was a child. Thirty years later, it was January 2014, I lived in Brazil, and I was about to begin a peculiar experiment. It was a bit crazy, perhaps, but I was quite excited about it. I would try to learn Mandarin Chinese exclusively by watching movies and other authentic video—just thirty minutes a day. I knew it would take quite a long time—perhaps six years, I imagined, to reach an intermediate level of comprehension. Fast forward eleven months. The project is going well. I’m learning a thing or two and having a lot of fun. It isn’t clear whether my method will prove minimally efficient, but regardless, I feel motivated. Once again, I’m an active language enthusiast, and I begin to think about my French. When I was twelve years old, I had learned the beautiful language a second time during a semester (five months, actually) at a French school in Burundi. I had the distinct impression that the fact that I had previously learned the language, when I was a little kid in Niger, made no difference at all. Nevertheless, since I was still quite young and made a lot of friends, at the end of these five months I was speaking quite fluently. Unfortunately, after returning to the US, my French deteriorated progressively. I didn’t forget it entirely like before, but for the subsequent twenty-three years, I had few opportunities to practice. So, now it’s December 2014. When I hear French, I understand reasonably well, but I am no longer fluent. My pronunciation is good, but my lack of vocabulary is so dire that it’s hard to complete a single sentence. It’s depressing. I’ve completely lost the ability to communicate naturally. Finally, it’s decided. I’m going to recuperate my French once and for all! However, I have the same problem as with my Mandarin project—lack of available time. I work hard as a government auditor; I manage my farm and tree plantation; I have to provide support to the language institute I founded; my evenings are completely taken up by Law school classes at the University of Brasilia; and, of course, most importantly, I have a family to take care of. While I was able to set aside at least thirty minutes per day to Chinese, it will be much less for French. “Ten minutes,” I decide rather impulsively. It’s what’s possible. In any case, I’m confident that, which this minimum time, I can make progress. I make some calculations: after two years, I will once again speak French fluently. Within five or ten years, I will speak better than ever and attain a C2 level, or Mastery, level of French in the Common European Framework of Reference for Languages (CEFR). That same day, I design a self-applied test to measure my proficiency in French. I don’t actually grade it; I’ll do that a year later, when I take the test again to assess my progress. Nonetheless, it’s obvious: my French is not fluent. My comprehension is good enough, but I express myself haltingly and without a shred of elegance or nuance. During the subsequent seven months, I did almost nothing except listen to Radio France Internationale (RFI). Normally, I would listen to ten minutes, but not every day. Thus, during the entire seven month period, I listened to a total of twenty hours, or six minutes per day. Other than that, I took a single conversation class and translated a short text. Just these twenty hours during six months have had a considerable impact on my French. When I meet a quasi-native French-speaking friend (in the US) in July, I am able to communicate successfully—still somewhat haltingly and lacking vocabulary, without a doubt—but nevertheless with significantly more confidence and ability than during my first (and only) French class in February. After this experience, newly motivated, I began listening to even more RFI and I added a new exercise on almost a daily basis: reading. I am reading my favorite book, which I have already read a dozen times in English and also in Portuguese, but this time in French. It’s Autobiography of Yogi by Paramahansa Yogananda. With renewed enthusiasm and having added daily reading, I have increased the time I dedicate to French. Through today, September 27, 2015, I have dedicated 37 hours of listening, 8 hours of reading, 6 hours of speaking, and 3 hours of writing (including 2 hours writing this text in French), for a total of 54 hours in 9 months. That is an average of 11.5 minutes per day. I’m looking forward to taking my self-test again at the end of the year. I’m confident that the results will speak for themselves and reveal significant progress. I believe that my initial projection was correct. At the end of 2016, at the latest, I will be able to confidently state that I speak French fluently again; and I hope that two or three years later, I will speak better than I did when I was a child in Burundi. Of course, a vacation or two to Paris will be warranted—or better yet, to the French countryside. In the meantime, I’m plugging away with my Chinese. Even spending much more time (40 minutes per day), the results are far less evident. I feel like a snail climbing a high mountain in the Tibetan Himalayas. Nonetheless, I’m having fun, and I know that I’ll reach the summit one day, safe and sound. Mastering languages requires the patience of a saint, or perhaps of a mule, but it’s all good. 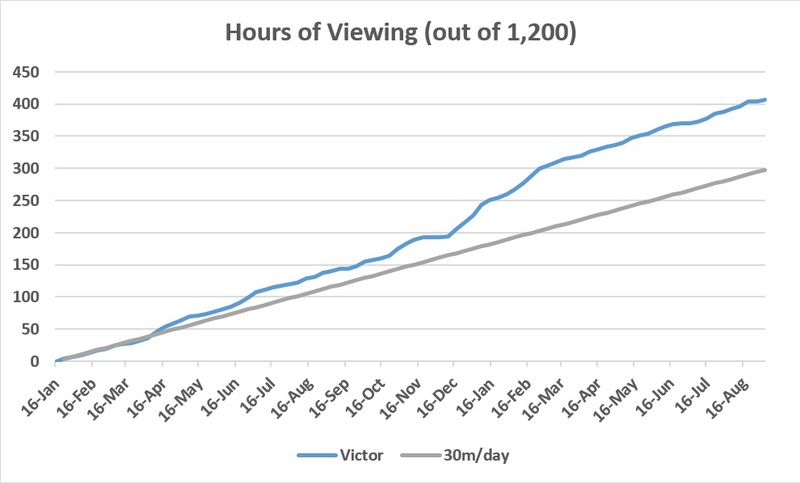 I have completed 400 hours of viewing, which is 1/3 of the total planned time for my experiment! Today I updated some tables, statistics, and graphs to provide a summary of my experiment thus far. I will not assess or comment in much detail on my progress or results obtained. I am doing that each time I complete an additional 10% of my experiment, so I will provide the next progress update when I reach 480 hours, or 40%. If you are interested in my progress, you can read about my recent careful self-assessment conducted at the 30% mark. As the following graph illustrates, I am averaging nearly 41 minutes per day, above the minimum 30 minutes I planned at the outset. I began my experiment on January 17, 2014. Last December, January, and February were the months I did the most Chinese viewing. Since then, I have been averaging about 30 minutes a day again. In previous versions of this graph, I also included my daughter’s progress, but in the past few months, she has done practically no viewing. 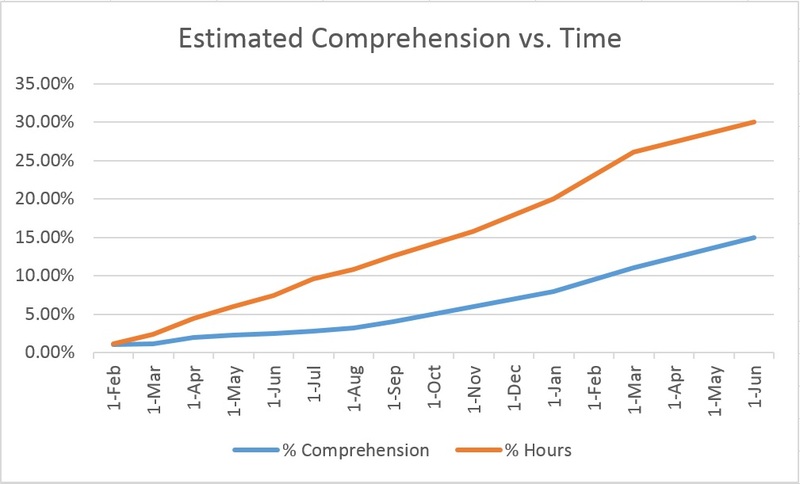 Though once again I would refer readers to my June post for discussion of the results, I will reproduce the graph in which I contrast the time I have spent on my experiment to my estimated comprehension. 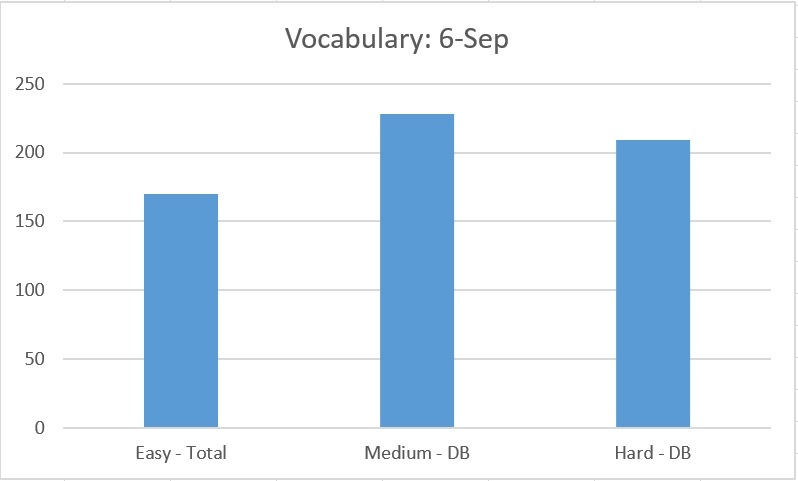 I created a new graph today to track my vocabulary acquisition. The data comes mostly from my word-a-day database, in which I make note, by means of a phonetic approximation, of words I am able to decipher from the movies and other viewing sources. I developed a simple spaced-repetition system within the database. When I watch that same video a second (or third, fourth, fifth, etc.) time, my database provides me with a list of the words I wrote down for that specific source. As I watch and review the words in context, I assess my own mastery of them as hard (not at all mastered), medium, easy, or mastered. My database now has nearly 560 words, of which 209 I currently consider “hard,” 228 “medium,” and 120 “easy.” Of course, I have picked up many words that have not made it into my database—in particular, words I learned before even starting the word-a-day system. For assessment purposes, I am most interested in words I would classify as “easy” or “mastered,” which assumes I would be able to pick these words out and understand in natural standard-Mandarin conversation on a regular basis. I am roughly guessing there are at least 50 words in this category, outside of my database. Thus, the total of “easy” words (including “mastered”) comes to 170. For the medium and hard categories, I am including only words in the database. Most of my viewing is of movies that were originally made in Mandarin—approximately 222 hours. In second place is my viewing of “Toddler” content. In this category, by far the most important source is Qiao Hu, which I have written about extensively. In third place comes cartoons, namely the Boonie Bears. Next, are Disney movies dubbed in Mandarin, followed by music videos, gleaned from movies, such as Nan Zi Han in the movie Mulan, and music for kids, namely Little Dragon Tales. Unfortunately, I haven’t had time to produce new Qiao Hu Study Guides since I started studying Law again. However, today I did finally update my Films table. I have watched 60 movies in Mandarin since my experiment began, and my favorites I have watched numerous times. I think anyone studying Mandarin will find this table very useful, whether viewing authentic sources is central to their study methodology or just an occasional side exercise. You can download the complete Chinese Film Table. For those who just want a taste of the information, here are the top ten movies and their aggregate scores (according to a formula I designed). In sum, after 400 hours of viewing, I am greatly enjoying my Mandarin experiment, and in terms of outcomes I consider it is being moderately successful, in that I am learning, but slowly. Someone came up to me at work the other day and said a sentence in Mandarin. He later explained that his wife is Chinese—apparently, he has also studied the language himself. I didn’t understand, so he repeated it more slowly. I then understood every word in the sentence, which means something to the effect of: “You are able to speak Chinese”, or perhaps, less literally, “Do you speak Chinese?” I had never head this sentence before (which is probably in any phrasebook, but I’ve never even glanced at one), but was nonetheless able to ascertain his meaning. I actually spent more time this week studying French than listening to Mandarin. Today I was listening to a podcast from Radio France Internationale, as I drove to my farm, about the elderly and nursing homes in China. Several locals were interviewed, and before the translation was read, one could hear the Chinese people speaking one or two sentences. I was happy that I understood several words in Mandarin. Nonetheless, I doubt I could already survive in China based on my language skills alone. Of course, I never speak, but even my oral comprehension has not reached a level of “survival Mandarin,” after nearly 400 hours of listening. By contrast, I’m guessing that in a day or two of studying Italian, I would reach survival level, and perhaps within 50 hours of studying German. That discrepancy points mostly to the difficulty of learning Mandarin, due to its utter dissimilarity to the Western languages I speak. It also points to a disadvantage of my experimental method. I presume that with 400 hours of traditional lessons, including the study of phrasebooks and flashcards, I would have attained a survival-level of speaking, though perhaps not of comprehension. Most likely, I would understand people who spoke simple, phrasebook-like sentences in clear, slow, standard Mandarin better than I do now. On the other hand, my comprehension of natural dialogue between natives might not be any better than what it is now—perhaps worse. In other news, I decided this week that I have been spending too much time making notes of vocabulary words that come up in videos, and then later reviewing them. In the past few months, I have been trying to register an average of two new words per day in my database. Thus, I will now go back to the original goal of just one word a day, which will allow me more time for relaxed, unstructured viewing of new content. In the next two weeks, I expect to pass the 400-hour mark, or one-third of my experiment. That milestone should inspire me to reflect anew on my progress and the months and years ahead. Stay tuned. I just went to a Walgreens here in New Haven, Connecticut. There were several young Chinese people in the drug store buying food and beverages, among other things. They were chitchatting among themselves, and—lo and behold—I could pick up a lot of what they said! I understood things like, That’s not delicious, drink, Let’s go, Why?, What’s that? / It’s tea, a girl counting her coins, and so forth. I am so excited I came back to my hotel and immediately starting watching some scenes from Hero. Today I had two informational interviews at Yale Law School, which I scheduled since I knew I would be in the area and I’m trying to decide what I want to do after I finish my degree at the University of Brasilia. Last night, as I thought about the interview and prepared to articulate my motivations for studying Law, I reflected that, in a sense, they are similar to my motivations for acquiring languages. Both Law and languages are instrumental to understanding and navigating a particular society. If you speak the language in a country, you have far better access to everything it has to offer than a foreigner who does not. One of my basic motivations for studying Law in Brazil is that I noticed how lawyers there were much more effective in handling various practical situations as citizens—not to mention consumers, entrepreneurs, landowners, as so forth—than those not versed in the principles, concepts, specific regulations, and even the jargon of the legal profession. Beyond the evident practical advantages, both language mastery and deep understanding of a country’s legal system provide incredible insights into the culture, the people, and what makes a society tick. On an intellectual level, I take great satisfaction in having these tools to help me interpret not only my countries, but the world and human nature itself. Incidentally, as I wandered the Yale campus between interviews, I passed by countless Chinese tourists. One group saw me in formal attire, sitting on the Law school steps, and—possibly mistaking me for a student—asked to take a picture with me. They were from Beijing, which may be why I was able to understand many words they spoke among themselves. I felt attracted to the various groups of Chinese people in a way I never would have before my experiment began, and I felt quite motivated to continue my project! That is quite funny because, in truth, a big reason for my Yale visit was to motivate myself to plough through the remaining 2½ years of Law classes in Brasilia. Thus, I will leave New Haven with at least a somewhat renewed drive for my studies of Law and of Mandarin. Since I last wrote, I have watched Qiao Hu and clips from Dragon or Hero on most days. I have put in 383.5 total hours, which means that in just 16.5 more I will have completed one-third of my experiment. I should also mention that I spoke a few hours of French this past week with a friend from Switzerland, who is a near-native speaker. I dutifully logged the time in my spreadsheet, along with a good deal of listening to Radio France Internationale (RFI). Just this month of June, I have logged 10 hours of French for my French Fluency Recovery Project—by far my best monthly tally to date. Prior to this month, my daily average—considering the entire period starting December 20, 2014—had been about 6 minutes, and now it is just over 8 minutes, closer to the minimum of 10 that I established as my goal. I was quite happy to be more conversational with my friend than I had been in January of this year when I took spoke for an hour with a Français Naturel teacher, and by the third day of the visit I was feeling more comfortable with the language than I have since 2006, when I similarly listened to RFI for a few months and also had some classes and conversations with the native-French-speaking manager of NLI at the time. I still feel far from fluent and natural in my speaking, but I believe I am making good progress. Of course, I do need to diversify my listening, as I noted that I was my news-related vocabulary was sharper than my recollection of simple day-to-day words.